Not so much, says me. Either the mailman dropped it off at the wrong house (he does that–we joke that he’s trying to keep us neighbors in touch with each other), he checked off the wrong box on his screen, or someone stole the package. In which case I can imagine the person opening it, looking at the wiggly silicone bar molds and going, Well, *that* wasn’t worth the felony. 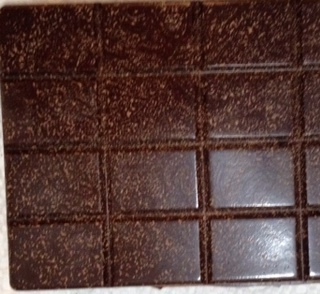 A friend asked us how much chocolate we planned to make, after savoring the small bar we’d just handed him to try. The answer, it seems to me, is, enough to make sure we always have at least a little on hand whenever we might like to have some for someone who stops by like he’d just done. Right? The extra sets of molds should be here tomorrow, at which point we’ll be able to start a larger batch than the previous one-pounders. The hearing aids needed cleaning and Los Gatos Birdwatcher where I buy my seed is less than a mile from there. So I combined the two trips, as I often do. When the tech handed me back my ears I asked her, Do you like dark chocolate? Like, really dark chocolate? She laughed at the highly unexpected question and said, I guess so, not knowing how dark we were talking here nor why on earth I was asking. 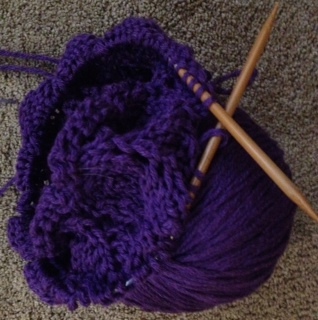 Well, we’ve been experimenting with our new toy… And I offered her one of the squares from our bars. She laughed, she ate it, she was delighted at the idea of it and at my sharing. I’m not convinced she was entirely enamored of the actual chocolate, but she definitely went home that day with a story to tell. On to the birdseed store. Where there was a clerk I’d never seen before. She was warm, helpful, approachable, just a gem of a woman and after she loaded my twenty pound bag up for me I asked her the same question and got the same startled, laughing response–only this time with, I LOVE dark chocolate! Love it! She had no idea you could make your own. She sure does now, though. I rather imagine soon she’ll have a story to tell me about her own. You knew this would be coming soon. Round two. Just one pound again, because we’ve learned that that’s how much our set of four molds holds so we ordered two more sets but they won’t be here for a few more days. 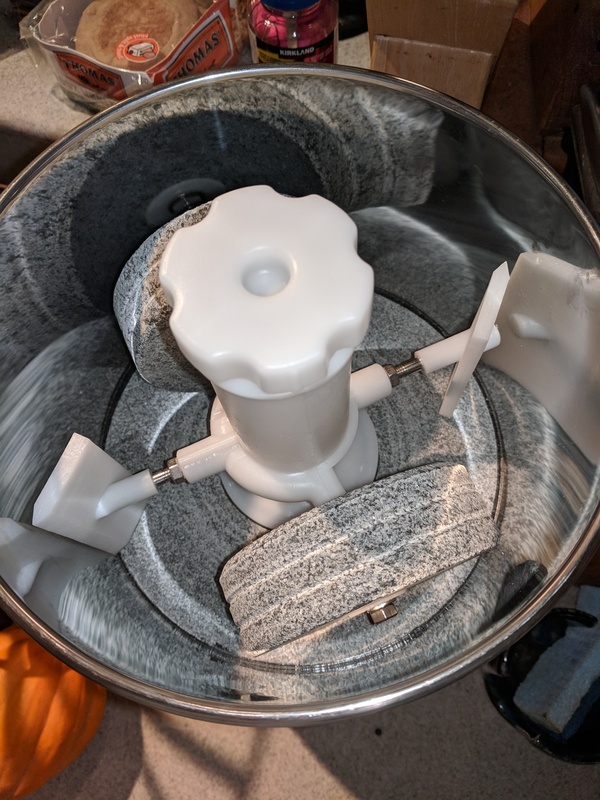 Mistake made: if you have one, you’re supposed to Cuisinart the nibs and the sugar, separately, to make the conching faster and the nibs easier on the machine. 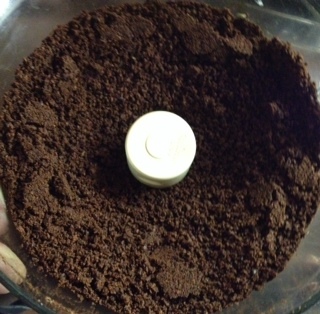 This time I ground the sugar first. But wait, he points out, looking at the bowl coated in a fine white afterwards (did some of it powder and then melt from the friction?) They said having the sugar touch the chocolate magically transforms the flavor to stop it from changing any more right at that point–do we want to stop it before it even starts? Would it, so early on? He got out the second Cuisinart bowl (that I’d long forgotten existed.) I wiped down the only blade with a dry paper towel. Next time we will remember and pulse the nibs first. So the melanger is working its initial magic and the sugar has yet to be poured in. But it’s ready. Addendum the next day: we put the sugar in at about an hour forty-five minutes in last night. This evening, we put a metal mixing bowl in the oven at 100F so that the chocolate won’t cool too much too fast. 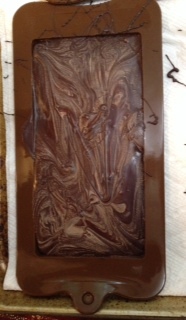 Measured 4 g Mycryo powdered tempered cocoa butter, which comes to roughly a tablespoon for the pound of nibs we used. Poured the chocolate in the bowl, which was warm but 15F cooler than the stirring chocolate was, mix that powder in thoroughly and quickly, and then poured our mix into the molds. 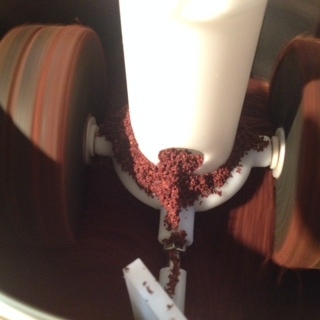 I noted for the first time that the chocolate in the grooves of the rollers I’m starting to clean was sweeter than elsewhere. For Christmas a year ago, our chocolate-enthusiast youngest (wonder where he got that from?) gave his sister some cocoa butter in powder form that had been crystallized so as to properly temper chocolate. 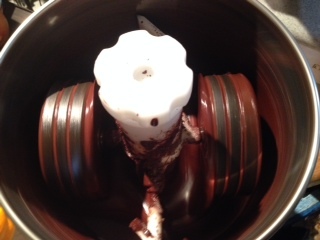 She wasn’t sure what to do with it at the time, but it still seemed fine yesterday as far as we could tell and would be a shortcut method to getting a proper temper, so we tried vigorously stirring 1% worth into the new chocolate as we poured it out of the melanger. Which has to be where the speckles came from? But the swirls on just the one…? 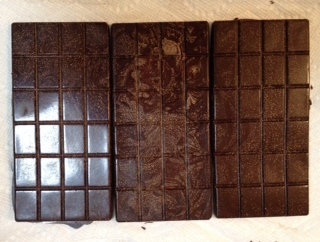 Our bars came out of those molds not looking like anything we’d seen before nor expected but that chocolate definitely had the shine and snap of a good tempering, no matter what they looked like. I think the marbling pattern on the one is pretty. Just don’t ask me to reproduce it–I have no idea how we did that. 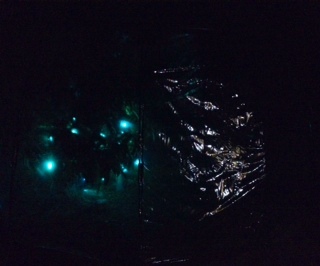 Wrapping them in aluminum foil was a bit of a comedown, but hey. Betty’s been blind since birth. We noted that Phyllis did not tell the story of the time Betty decided her late husband was too drunk to drive them home so she was going to do it, and did. Betty loves music, and tried learning the piano as a kid but found the accordion easier to find where her fingers should go and so that was her instrument. The lady is a kick, and she is fearless. She had guide dogs for 71 years till old age caught up with her and she misses them. She is mostly bedridden now but she made it through the evening in a wheelchair. Richard had tucked one of our brand newly made bars of chocolate in his pocket on the way out our door. Betty did like dark chocolate, she said, but couldn’t eat any more tonight. So the ironic thing is that it got shared in small pieces with just about everybody but her, but she and they had a fine time and that was the point. One person had gotten her a birthday present: a long soft stuffed dog to hold across her lap in memory of all the dogs she’d loved, like a lap blanket to keep her warm on this cold and rainy day. She stroked it and then rested her hands on it and loved that her beloved dogs were thought of, too. It had a face with the colors of a Saint Bernard but in the shape more of a German Shepherd. I told her about my grand-dog the (mostly) Saint Bernard. She answered that German Shepherds in her experience were smarter and she liked those; I laughed and agreed and said that our Ludo is very sweet to our oblivious toddler grandson whose parents are working to teach him how to be nice to the dog, but she is emphatically not overly bright. (As I pictured Mathias’s gleeful, “PupPY?”) She’s good with him, and that’s what they need. I hope someone brings a real dog by sometime for her to pet. I do know we need to stop by with some chocolate for when she can eat it. Maybe not quite so dark on that batch. So I took this picture not long after we started the melanger going. I had toasted one pound of nibs on a cookie sheet at 350 for ten minutes. They smelled maybe done at nine and a half but the instructions I’d found online for nibs (the Dandelion book is all about the beans) had said 10-15. Don’t do fifteen. I waited those last thirty seconds and they came out threatening to taste burned, I worried at the time. Which is part of why that’s all that went into the first run: I had to know if I’d wrecked them. 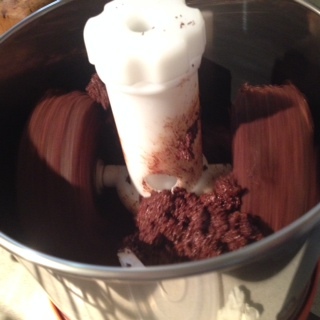 Then I ran them through the food processor (per the book) to cut way down on the conching time. But wow, the conching does marvelous things to this. No more worries about it being burned. Such a different flavor from raw, and even from straight out of the oven. And that was just in the first hour. I ran the sugar through the Cuisinart too and added it in slowly, slowly, wait and then a bit more, about 90 minutes after the nibs had gone in, but it was such a small batch that I probably could have just dumped the whole thing in and the machine would have done just fine. Masonis said that whatever the changing chocolate tastes like when the sugar hits it is what you’re going to get, that somehow the sugar freezes the flavor in place at whatever it is at that point. (Turning it off briefly an hour later and sampling.) I can handle that. Wow. Yes. This will most definitely do. It reminded me of the time years ago when I asked someone why she went to the effort to knit socks, which would just get worn through anyway and wreck her work? In response she handed me one to try on. I had had no idea. I’d never had a sock feel like that on my foot in my life. So comfortable: it was revelatory. That sense of epiphany was what tasting the tip of that spoon of fresher-than-anything-in-your-life chocolate was like, and it isn’t even done yet. So there’s this particularly good chocolate maker in San Francisco that’s been trying to fill in the gap from where Scharffenberger left off after it was sold to Hershey’s at the passing of one of the founders. It turns out the co-owner of Dandelion Chocolate wrote a book. I thought it was going to be all about the creation of his company. So, being a fan and it being Christmas, I ordered a copy for my sweetheart, having no idea that it was a how-to with the guy open-sourcing to the world what he’d learned and how to do it. Note that clicking on that title is surely how The Big River in South America dangled a ‘people were also interested in…’ page at me awhile later, even though at the time I had no idea whatsoever how I’d landed there. Because, as it turns out, within those pages the author highly recommended the Premier Melanger for the hobbyist or start-up. We had never heard of such a thing. 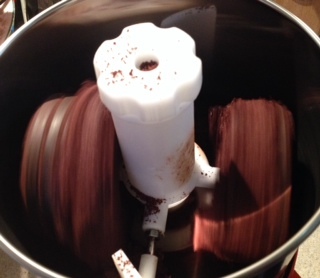 A countertop cocoa bean grinder and concher? Who knew? We had been hoarding Discover points on Amazon for some time for some future Big Unexpected Thing, or Thing We Will Wish We Had Saved Up For whatever that thing might turn out to be, and when I saw this and showed it to him we both agreed that that Thing was right there in front of us. Because how could you do better than this in the search for something to surprise, delight, to last a very long time to come while never letting go of being a total blast to play with? Per the instructions, we put two cups of sunflower oil in it last night after it arrived (it was the anticipated big box that came after Ann’s big box) and let it run for an hour and then hand washed it. (No dishwashers on this thing.) 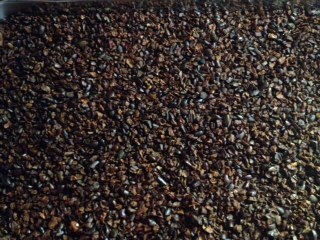 You can’t start a batch immediately after: a single drop of unseen water will change the crystalline structure and cause the chocolate to seize into an unmeltable lump. We had to wait. Yes I definitely think this is going to be fun. A name. It needs a name. Choc Chop? Criollo de Couer? Elle El Bean? Dinner chez Nina, then home and FaceTime with kids and grandkids. Books and chocolate, lots of chocolate, and some very good yarn. Who knew the Japanese knitting stitches book was in English now? Merry Christmas and every holiday celebrated and may the peace of goodwill be with us all. I couldn’t find the old decrepit cookbook I’d written the recipe down in back when my kids were pretty little. Good thing I wrote it down here on the blog ten years ago, just in case. The cranberry pecan pie bars just came out of the oven. Best cookie recipe ever. The email went out this morning and it noted that that lack of prior notice was deliberate: they didn’t want people to feel stress about it. Just joy in each other’s company. Food was going to be provided. If you wanted to add something, sure, but no need, and please to know that they were not seeking sweets. Which might explain the variety and number of bottles of shelf-stable juice. We brought several pounds of grapes snipped into small bunches. Thus church was one single 70-minute meeting that was mostly Christmas music: the choir, the children, the congregation–and then we adjourned to where long low tables were set up for the little ones, adult-height tables for the grownups, and chairs around the perimeter for those who just wanted to sit a moment while doing their mingling. That way, the brownian motion of small children was kept a little away from the frail elderly. Fruit and more fruit. Rolls. Sliced ham. Vegetarian options. Condiments. Fruit juice, milk, everybody welcome. Go talk to someone you haven’t had a chance to before. A homeless man I’d never seen before showed up and was welcomed to join in. It could well be that the regular attenders in that situation had let him know about it. Cool. That’s okay, there was plenty more. It is a recipe I will wish for forever and can never have. An older woman got on her flight at that airport who spoke maybe five words of English. She needed help. It took about five minutes of pantomiming between them and trying before it became clear: she needed to borrow a cable to recharge her phone. Turns out she needed help figuring out how to actually use it, too. No problem. Turns out her phone needed a new battery to take that charge better and faster, but at least they got it halfway there. You need it to work when you’re landing in a strange country trying to reach your family over at park and call. And in profuse thanks the woman tried to shower her with good food. She didn’t want to be rude but there was no way they could find enough words in common for her to be able to make sure that she wasn’t allergic to every bit of it–and so she accepted the tiny wrapped bites of good chocolate and the clearly freshly homemade biscotti inside that white napkin and brought it home to us for it to be properly appreciated. Definitely butter in that, yes. A nibble, one for him one for me, was the plan: the rest would go towards breakfast in the morning. But no, once we’d tried that perfect taste and texture we devoured it all. And I’m not usually someone who cares for biscotti–why break a tooth over something so dry and tasteless? I’ve been trying to deconstruct it ever since. Probably superfine almond flour for most of the flour; the nuts were chopped fairly small and roasted to perfect crispness and flavor as if they’d just cooled from the oven. You had to have a hand under the result to catch what crumbled when you bit because you didn’t want to miss out on any of this. It might even have been made this morning–whatever day however many hours ago this morning started out as over there. 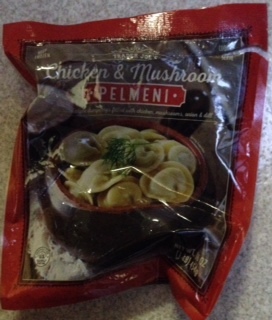 But then, you would expect a woman presumably from Turkey would know how to make this right. And boy did she. And I can’t even thank her. I hope she gets her phone taken care of while she’s here. I found myself sitting next to a fellow grandmother and knitter, a woman from India who loved watching my hands work as we delighted in each other. She was a treasure. The doctor was the ENT whose love for taking care of his fruit trees had triggered my planting mine, and look where it got me now. Enthusiasm is contagious that way. So I brought him a gift in a small Penzey’s box: one perfectly ripe, slightly funky-shaped rather small apple that had grown to fit the produce clamshell that had been squirrel-proofing it. I told him it was my final Fuji of the season. He laughed in wonder, saying he’d picked his last Fuji in August! Microclimates R Us, I guess. It smelled perfect. I hope it was. There had been two, and we can tell you that the other had made it clear how good they were now. Poor little noodle. It was glorious in Italy but as it marched north its pace slowed and when France was no longer in sight its flavors jumped out the train windows in despair. A prisoner now in its Siberian surroundings, it did what it could. And now you know the inspiration for the great Russian novels and why they’re always so mournful. Their pasta is in a pickle. And the pasta is prologue. A chocolate tasting party: bring your favorite or your favorite creation out of it or just bring you. Now that is an idea I could really get into, and it is safe to say I did. It was an excuse to get to know some women better, and what better way to do so? I might not sleep tonight but it was worth it.